To read a chapter in "The Following of Christ"
To make a spiritual communion. Which is the better way to spend five minutes? To be tormented in long pains and to be cleansed and purified from one's sins by continuous fire, is a different thing from expiating one's sins all at once by suffering (of martyrdom). by the late Father Kilian McGowan. C.P. Our quest for God in this life may be summed up into two basic movements of the human spirit: First-to live unto God, and secondly-to die unto sin. 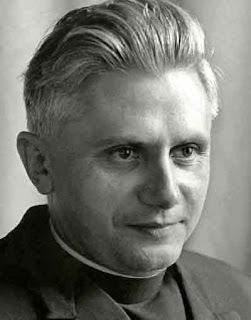 Our perfection as Christians consists in a wholehearted and practical love of God; and sin is the only real obstacle to this perfection. The Catechism tells us that sin is a thought, desire, word, deed or omission against the law of God. This cold language unfortunately fails to dramatize the betrayal of God's love that is found in mortal sin. For mortal sin is far more than a transgression of God's law; it is a rejection of God Himself. It does much more than gravely damage the soul cast in God's likeness; it actually evicts the Adorable Trinity from its residence in the human heart. It is wholesale disaster for the follower of Christ. First, let's take a look at the very key world "resolve". What is a sincere resolution? It's not a half-hearted hope to do better. It's not a wishy-washy intention to do God's will. It's a firm determination!! Note those two words: FIRM and DETERMINATION. A firm determination is a demanding leader that is resolved to use every possible means to achieve victory. Here the victory is to be won by total warfare against that enemy we call "sin." The first weapon is PRAYER. Not just morning and night prayers, or rosaries and novenas. But prayer with or without words-at ALL times and in ALL our needs. Our Lord warned us to pray without ceasing and to pray least we fall into temptation. Under this leading may we include the thought of the Presence of God-one of the greatest bulwarks against temptation; and meditation on the life and suffering of our Blessed Lord. Many saints have said that it is impossible to meditate daily on the Passion of Jesus and still hold onto a habit of serious sin. One or the other must go! A second means is the SACRAMENTS. Each sacrament produces a certain spiritual effect in your soul. The sacrament of Penance not only destroys sin in the soul of a well-disposed penitent; it actually and really weakens the tendencies that lead one into sin. Because it attacks the disease of sin at its source, we can quickly see how this spiritual therapy must be used to maintain or regain spiritual health. To explain how the Eucharist helps in this warfare against sin would take volumes. Suffice to say that it heals the scars of sin, infuses new spiritual energy into the campaign, and recalls the wandering inclinations of our heart and soul to God. It does all this in a very direct way-by bringing the Savior Himself into our hearts. Of all remedies, this obviously will ever be the greatest, because It gives you ALL that God has to offer. 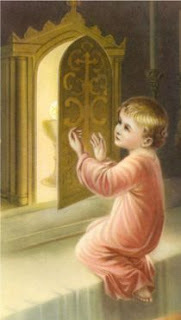 Now, you may pray often-you may receive the sacraments frequently-even daily, but still that is not enough. You must also avoid the OCCASIONS OF SIN. This is the third means. Without this you have no firm determination to avoid sin. Occasions are, of course, those persons, places and things which you know from past experience have been the cause of your spiritual downfall. Don't kid yourself into believing that you can still love God and hang onto these occasions of sin! We have seen briefly what sin does to us. To see what it did to God, take up your crucifix. That's the price our Lord was willing to pay to deliver you from the slavery of sin. What are you willing to do to avoid that slavery and to show a grateful love? We should start with a firm determination to avoid mortal sin. But before you do-if you haven't already-ask our Blessed Savior for the firmness and determination! Tito over at CUSTOS FIDEI has an interesting and thought provoking post and reminder on redemptive suffering and the tragedy that occurred on Monday. ..."In layman's terms, when we suffer, we can offer up our suffering to Jesus Christ for the forgiveness of our sins. Ergo, we have the opportunity to redeem ourselves through our suffering! Hence the term redemptive suffering. Why or how do you say this is possible? Because He died for our sins! Because He conquered death when He rose again! Jesus went to the Cross as the ultimate sacrifice for the sins of man. Jesus became the sacrificial lamb for mans sins. Before Christ His chosen people would slaughter lambs or other animals to redeem themselves for their sins to God on an altar. When Jesus went to Golgotha, the place of the skull, He became the ultimate sacrifice for all of mans sins. There can be no greater sacrifice than this! That is why the Eucharist is the centerpiece of the Mass..."
It is hard for me to tell someone to "offer it up" when I have not experienced the anguish or pain that the victims and their families at Virginia Tech have. However, as Catholic Christians, we should always have it in the forefront of our minds and hearts to never waste our sufferings. For to do so, would make our sufferings all for naught. 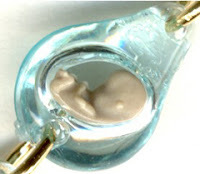 Thanks to the new Catholic Moms Online Blogroll, I am visiting some new and interesting blogs.One of them is Sharon's The Bird's Nest. Sharon posted about sharing our favorite rosary beads. I have a few favorites like the one my mom gave me with the crucifix shaped like JPII's staff or the white rosary beads, the Franciscan Sisters of St. Elizabeth gave my DH and me as a wedding gift. Another favorite was also given to me by my mom...pressed rose petals with the Holy Family in the center before the start of the 5 decade beads. For every day use, I pray my rosary on a medal finger rosary. Following excerpt is from My Daily Bread by the Confraternity of the Precious Blood. He wishes to avoid hell or a loner Purgatory than he now has. He desires to make reparation for past sins by his present efforts. He wants to please God by overcoming his faults or increasing his virtues. 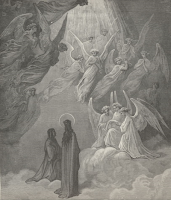 He seeks to help the holy souls in Purgatory. He is striving to obtain a particular favor for himself or some other person on earth. He may even be working to insure or increase his glory in Heaven. Finally, he may have the highest motive of all...to give God an unselfish proof of love, by simply embracing his trails because they are a part of God's all-wise plan. 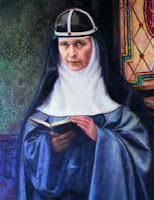 I therefore encourage Catholics to pray fervently for the dead, for their family members and for all our brothers and sisters who have died, that they may obtain the remission of the punishments due to their sins and may hear the Lord's call: "Come, O my dear soul, to eternal repose in the arms of my goodness, which has prepared eternal delights for you. Sue shared this from Suicide of the West's Blog post "What if No One Cared About You"
Of all the sufferings in the world, I’ve always thought that loneliness must be one of the most brutal. We spring from the womb craving human love and contact. Giving and receiving love is the emotional staple of our existence. To be deprived of it, especially later in life, is an unimaginable grief. Pity, then, Vincenzo Ricardo, of Hampton Bays, New York, who was found dead in his home this week. A neighbor had called the police to complain about a busted water pipe at the Ricardo house. When police entered, they found Vincenzo dead, sitting in a chair in front of a blaring television. After an autopsy, it was determined that he had been dead for over one year. In all that time, no one had expressed any interest or made any inquiries. Imagine that. A person so alone in the world that he could be dead for a year, and no one noticed. The only possible grace is that the year he spent dead was likely less tortuous than some of the years he spent alive. Click link above for the rest of the post. Is it any wonder that God gives us two of the greatest commandments to follow: Love God with all your heart, mind and soul and love your neighbor as yourself. We have not deserved to pray;but God, in His goodness, has permitted us to speak to Him. Our prayer is an incense which He receives with extreme pleasure. Approximately three years ago I was visiting my parents in New Jersey. The phone rang and I picked it. It was a priest, Father Joseph Whalen returning my mother's call. Not much more thought was given by me because it was not unusual for my mom to receive calls from priests or religious. Afterwards, my mom showed me a copy of Medjugordje Magazine featuring the amazing story of a late vocation priest. That is Fr. Joe. His ministry now is in making, blessing and distributing St. Raphael's Healing Oil to those who request it. The other day, I decided to offer our little vial of the healing oil which is as you know a sacramental, to one of our friends who is suffering from cancer. He was so happy to receive it! I explained to him that it was not to be used as something magical but as I mentioned above, a sacramental. Even though he is not a practicing Catholic, he understood. I am still in awe of his faith. Well, that left our family without the healing oil. I emailed Fr. Joe and told him to pray for our friend Phillip and to please send me another vial of the healing oil. As a side note, a year ago, a lady who used to be a good friend of mine was suddenly taken to the hospital with severe stomach pains. The doctors had no idea what was causing it. When I went to the emergency room to see her I brought along the vial of the healing oil. Another friend of ours and I blessed her with the holy oil and also recited the prayers that accompany the oil. Well, it turned out that the stomach pain was nothing life threatening. However, the doctors did discover cancer of the kidneys. My friend had surgery and she was healed from the cancer. All of us owe a big debt of gratitude to the healing powers of the holy oil and of course to God. Back to my story, I received a note in response stating that they were two weeks behind in mailing the holy oil. However, in a few days, I received the oil! Not only one vial, but two!! How kind of Fr. Joe to send me more in case another friend was in need of them. We do not sell the holy oil, it is available to all and many who cannot afford a donation. Those that do contribute make it possible for us to send to the poor and cover all of our operating expenses, postage, materials etc...(US funds only)you may send it after you receive your packet, Fr. Joe's name and address will be on the envelope. Please tell him in your letter that you received your holy oil. So however the Holy Spirit moves you...your Love offering will be gratefully appreciated. 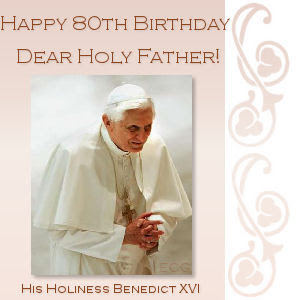 May God bless you abundantly on this your 80th Birthday. 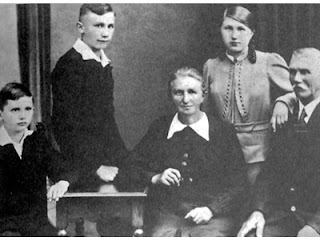 The Ratzinger Family. 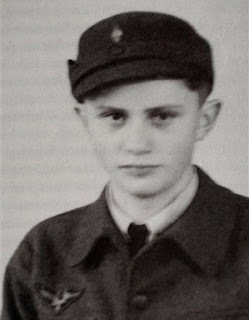 Young Josef Ratzinger is on the far left. Every day, I try to read my favorite blogs. Sometimes, I don't have time to read or visit their blogs as thoroughly as I'd like to. That happened with one blog in particular. 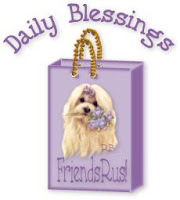 Well, yesterday, I took my time visiting Margaret Mary Myers's Blog and I am sure glad I did. I never noticed that she wrote the sweetest little book on St. Therese the Little Flower. And, better still, she is kind enough to offer it free in pdf form. It has a question and answer format which is perfect for the little ones in the family to learn more about this very popular young saint. BTW, while you are there, check out the other book written by Margaret Mary, Chats with God's Little Ones. It looks like a must-read for Catholic children. Mahalo nui loa Margaret Mary! Dear Lord, I do not ask to see the path. In darkness, in anguish and in fear, I will hang on tightly to your hand, and I will close my eyes, so that you know how much trust I place in you, Spouse of my soul. Gratitude is characteristic only of the humble. The egotistic are so impressed by their own importance that they take everything given them as if it were their due. They have no room in their hearts for recollection of the undeserved favors they received. The Bishop of Honolulu, Larry Silva, has dedicated the Diocese of Honolulu and the Hawaiian Islands to Divine Mercy. Star of the Sea Parish has led the Divine Mercy Novena since Good Friday and it culminated with a 3 0'clock Hour of Mercy...with a Holy hour of worship on Mercy Sunday. St. Peter's and Paul Parish was good enough to hear confessions the day prior to Divine Mercy Sunday. 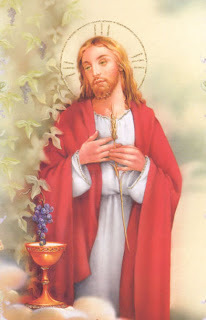 Thus giving many of us an opportunity to follow the directions of Jesus Himself to go to confession right before this Feast Day. Upon entering the Church, we were greeted with the Image of Divine Mercy, that was placed at the foot of the Alter and in front of the Blessed Sacrament. 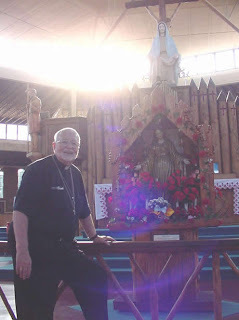 Sacred Heart Parish did not have the image of Divine Mercy displaced as it has done in the past, but Father Bob Donnelly gave an inspirational homily on Jesus' Divine Mercy. May God continue to bless our Diocese. Jesus commanded me to celebrate the Feast of God's Mercy on the First Sunday after Easter. 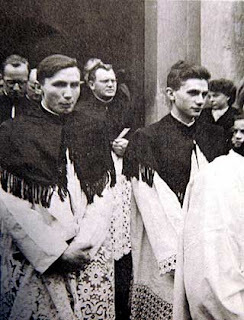 [This I did] through interior recollection and exterior mortification, wearing the belt for three hours and praying continuously for sinners and for mercy on the whole world. And Jesus said tome, My eyes rest with pleasure upon this house today. From Divine Mercy in My Soul Diary of Sister M. Faustina Kowalska, published by Marian Press, Stockbridge, MA. I am currently reading the Diary of St. Faustina. 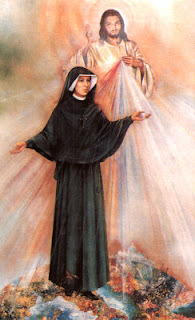 The above passage tells us when the first Divine Mercy Sunday was celebrated by St. Faustina. As you can see, she commemorated it privately. Last year, my family and I attended the Divine Mercy Conference. It was at the conference that we were introduced to the beautiful artwork of artist Tommy Canning. 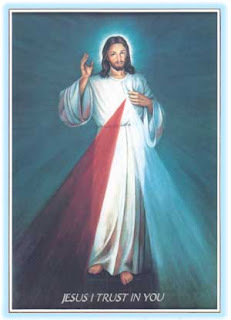 He is known for the art of Divine Mercy. In fact, we met Tommy Canning and his brother who attended the conference. A couple of the items of note that we got at the conference were a DVD of the Divine Mercy artwork set to the music of the Passion of the Christ. The other one was the painting of St. Faustina kneeling before Jesus, the Divine Mercy. That one is autographed by the artist. 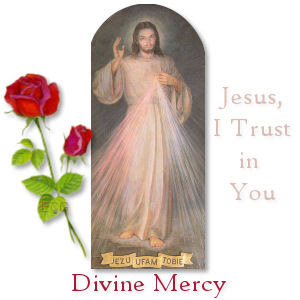 The following video showcases some of Mr. Canning's Divine Mercy artwork and I thought it appropriate to post it on this Divine Mercy Sunday 2007. The song is entitled How Beautiful by Ann Wilson.